An efficient, reliable central heating system is the perfect way to ensure your home feels warm and cosy throughout. As a family-run firm with many years of providing central heating installations in Menston, here at Tuke Heating we’re proud of our excellent reputation for reliability, professionalism and friendly service. Buying a new central heating system is a major expense and we know that installing a new heating system can be a daunting experience for many homeowners. Our impartial, non-biased advice and expertise is available for all central heating installations – from new boilers or radiators through to state-of-the-art central heating systems. Our services are available to residential customers, businesses and landlords and if you’re looking for a central heating specialist in Menston, look no further than Tuke Heating. We pride ourselves in offering unbiased, realistic advice on the different central heating systems and boilers which are currently available. 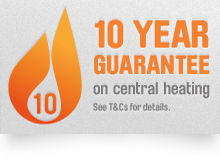 We are a regulated and accredited company with the expertise to install, service or repair the majority of boilers. As registered installers of Worcester Bosch boilers, our team of engineers can fit these boilers which come with an excellent reputation for reliability and a hard-to-beat warranty of up to ten years. So what makes Tuke Heating different? By choosing us you’ll find that we are local central heating specialists with a reputation for offering a winning combination of unbeatable customer service, professionalism and reliability. From the moment you get in touch to the final signing off of a job, we’ll work hard to ensure you’re happy with each and every aspect of our service. For more details or information on our services for the installation, repair or servicing of boilers and central heating in Menston, please get in touch today.